Years after the events that brought the Triforce to rest in Hyrule Castle, a new king was able to claim it for himself, and used it to rule justly for many years of peace and thriving. The frontiers were expanded and the borderlands and islands joined the blessed Kingdom of Hyrule. Then one day, a strange force drew a young lad with the crest of the Triforce on his hand, whose name was Link, deep within Hyrule Castle and in the Triforce chamber. It would seem that it was possible for him to enter because the whole Power of Gold, the True Force, belongs only to the one who first touches it and thus couldn't be stolen. However, as he approached the relic, for a few instant the triangles joined in mid air; Link was enveloped in a shaft of light and the next moment he vanished. Then, as he was whirling in the void, he heard voices telling him these words: "Accept our quest, hero!" and lost consciousness. When Link awoke, he found himself in a forest he had never seen. Confused he looked around blankly at the unfamiliar surroundings. He heard pleasant music and laughing voices echoing from deep within the woods. Link followed the inviting voices until he came upon a traveling troupe of actors. He was immediately struck by the beauty of a young woman who was dancing about in circles. 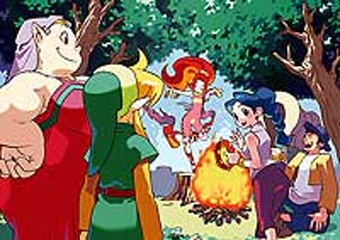 Among these people, Link met a certain Impa who introduced herself as the troupe's cook. And then strange things began to happen throughout the land. When Onox imprisoned the Oracle of Seasons and buried the temple that houses the Season Spirits, the seasons of Holodrum (where Link had been taken by the Triforce) fell into chaos and the land was deprived of the beautiful gifts of nature. Life was slowly being drained from the land, and all living things began to wither. Thus, Onox set in motion his plan to gather the power from the withering land and create a world of total darkness. Impa found Link and helped him get back his senses. She then revealed that she was in truth the nurse of Princess Zelda, and explained that Din was the Oracle of Seasons who wields control over the forces of nature. Zelda had a vision of darkness drawing around Din, and sent Impa to secretly take the dancer to Hyrule. Upon seeing the triangle mark on Link's hand Impa realized he was the hero prophesized in ancient Hyrulean legends and pleaded him to undertake the quest of saving Din. Link accepted, and following Impa's instruction went to see the Maku Tree, guardian of Holodrum, in Horon Village (and to Link's surprise, it turned out that being the Hero allowed him to talk with animals and even some plants). To meet the tree he needed a sword though. He heard of an "Hero's Cave" that would house a legendary sword... but he could hardly hold sarcasm as he found one of wood. Yet it was a sword and served its purpose; besides, on his quest he would find better ones. The tree informed Link that evil was lurking in the Northern Peak where the Temple of Seasons used to be; that he would need the eight essences of nature to break the shadow barrier protecting Onox, and gave Link a key to the first of the dungeons in which the essences were. So, Link's quest begun; as he collected one essence after another, he made many new friends such as the oddly familiar farmers Malon and Talon, the Biggoron and the elusive Subrosia people inhabitants of Holodrum's underground. The temple of Seasons fell right into their domain causing the flow of lava, their food, to grow thinner. Upon entering the Temple the Season Spirits handed the Rod of Seasons to Link; an essential artifact for his quest, that with their power could change the season in any place he would go. He also met the Oracle of Secrets, Farore, that promised him help once he had learned secrets she could give shape to. However, as he approached the sixth dungeon a mysterious figure appeared before him to state that no matter what he'd do, the world would soon be filled with destruction sorrow and despair so that the "great sacrifice" could be offered and the Evil King revived. Nevertheless, the youth continued his quest and eventually collected all eight essences. With the energy of the essences the Maku tree grew and gained the strenght to create a special seed for Link, one that would allow him to penetrate the evil forces protecting Onox. But just as Link approached his castle, the mysterious figure appeared again, and before his eyes it turned in the Gerudo witches Koume and Kotake, also known as Twinrova. They threatened him once more, but Link continued on his way and fought Onox, careful not to harm Din. However, just when it looked like Link had won, Onox revealed himself as a dark dragon summoned from the restored Dark Realm by Twinrova. After a difficult battle Link vanquished the beast; but in its last moment, Onox stated that the destructive power of a seasonless land was already delivered to Twinrova and the Flame of Destruction lit. Still, Link was able to rescue Din, and thanks to her all returned to normal in Holodrum. She also warned him of an impending new quest, but that could wait as they went to celebrate in Horon village. Upon traveling back to hyrule, Din's warning was proven true as Link could hear the Triforce calling him. And sure enough he was sent on another quest. This time, he did not lose consciousness as he, once again, appeared in an unknown forest. As he started to walk through the woods, he heard cries for help coming from just up ahead of him. Link hurried toward the voice, only to find a group of monsters surrounding Impa. When the mosters saw Link, they immediately fled. Impa thanked Link and, after telling him she was looking for a singer named Nayru, asked him for help in her search. Despite the strange look she gave him and the fact she did not seem to recognize him, Link could not refuse her request. Together they found a large stone with a triangle carved on it. Naturally, Lik moved the stone, but Impa wouldn't so much as lay an hand on it. As they traveled even deeper into the forest, they found a young woman singing. 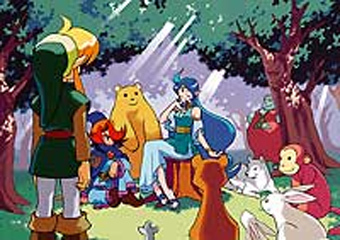 Invited by a group of peculiar animals that listened to the girl's song, Link joined in the circle and let the beautiful song fill his ears and penetrate his heart. This was surely Nayru, the singer Impa was searching for. The lad next to her, Ralph a childhood friend of Nayru, recognized Impa and Link as Hyrule's messengers and Nayru thanked Link for coming to her aid. Just then, Impa erupted in a cackling laugh and as a frightening shadow lifted from her body, a voice was heard. The shadow calling itself Veran, Sorceress of Shadows thanked Link for letting her through the sacred barrier and began swooping about the forest before flying straight into the body of the terrified singer. A blinding light shone forth from Nayru's body. When Link's eyes were again able to see, he realized that Nayru looked very strange. Her face seemed veiled in shadow, and her bright smile had vanished. A piercing evil gaze had replaced it. Ralph made an idle threat, as Veran was now in Nayru's body and fighting her with a sword would have ended the latter's life. With the magic of Nayru, Oracle of Ages, Veran went back to the past so that an age of darkness could begin and as soon as she vanished, the people in Labrynna (the land they were in) began to suffer from her meddling with time. Both Ralph and Link immediately set out to rescue the Oracle; the latter was told by Impa that she was supposed to take Nayru to Hyrule on Zelda's order, but made the mistake of not considering the hero of Holodrum for help. As a first thing, Link went to see the Maku Tree, guardian of the land, in Lynna city; but just as he was talking to the tree, it suddenly vanished because of something happening in the past. So, in order to restore the tree, Link went through the portal used by Veran 400 years in the past. He found the land, trees and Lynna village suffucating by heat and dirt from the construction of an huge tower that existed in the present too, apparently for the queen to look for her lover long gone on the sea, and learned that Nayru had become advisor to the queen. He was told that since Nayru came, the sun stood high in the sky and the work on Ambi's Tower, now the Black Tower, carried on endlessly. Link then reached the Maku Tree and after saving it from the Moblins Veran sent, Link returned to the present through a newly formed portal and went to see the Maku Tree in his time. The tree had lost some of its memory, but told him of a phrophecy that would be fulfilled if Veran was to climb atop the tower: "If one of impure heart gains the powers of shadow... this world will be covered in darkness." and that they would need the eight Essences of Time for it to regain its memory and to see through Veran's illusions. Thus Link went again to collect eight essences; this time, he'd soon find himself in need of one of Nayru's possesion: the Harp of Ages. In it the Oracle left a telepathic message that taught Link a melody to travel through time; in his quest he would learn more songs, and they all would prove invaluable. After Link collected the third essence, he was told by Impa that princess Zelda came to their aid but was kidnapped by Veran's minions, thankfully Link was just in time and it wasn't difficult for him to rescue the people's symbol of hope. Zelda immediately realized it was the hero of Holodrum that came to her rescue and as Link continued his quest, Impa and her remained into hiding in Nayru's house. On his way, Link would also meet several friends and enemies, some never met before like the Tokay and Zora people (whose King and deity he'd save from water poisoning) and some from the land of Holodrum. 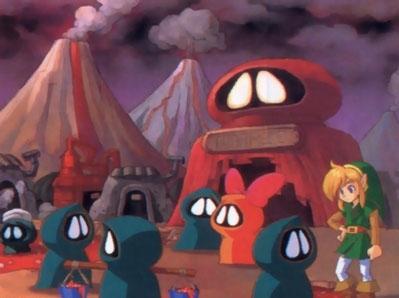 At times, they would have secrets to be delivered to the people in Holodrum; Link aided by Farore's magic would travel back and forth the two lands, collecting new items this way. Among these, the legendary Master Sword he obtained after passing the test of an old man dressed in a green robe. Upon collecting the sixth essence, Link and Ralph managed to enter Ambi's palace and release Nayru from Veran's grip. Unfortunately Veran was quick to posses the queen, but before she could have the soldiers seize them, Nayru helped Link and Ralph escape to their own era. With the Oracle of Ages freed, most of Labrynna returned to normal; however, Veran was still feverlishly at work to create an age of darkness in the past, and therefore, Link's quest was not over yet. Notwithstanding his efforts, Link was too late: by the time he collected the seventh essence, the Dark Tower reached the heavens and Veran could again stop time in many parts of Labrynna with the powers of darkness bestowed upon her. Thus Link went onward to obtain the last essence and be granted a special seed from the Maku Tree; with it, he could climb on top of the Dark Tower. But as he did so, the people's grieving lit the Flame of Sorrow in the room of rites; the time for the Evil King revival's was drawing near. Nevertheless, Link managed to defeat Veran and save queen Ambi's life in the process. Everything was returning to normal... but just then the Gerudo witches Twinrova kidnapped Zelda, the hope to the people, so that the Flame of Despair would be lit and the princess could be used as a sacrificial vessel for Ganon's revival. With his strenght renewed by the Triforce's might and the help of both Oracles, Link was sent to the Dark Realm where the rite was having place. There he fought and defeated the witches combined, Twinrova; but finding herself dying, the evil being used her own body as a sacrifice to restore Ganon. Because theirs was not the pure Holy Sacrifice, however, they brought back a mindless raging Ganon that couldn't protect himself from all weapons except silver arrows as he did in the past. And so, after an hard struggle, the Legendary Hero prevailed; but having been slain this way, Ganon's spirit could likely linger in the world, plotting to restore himself. Considering this, even though for the time being the world would again rejoice for a temporary peace, Link chose to dare the seas, in search of the experience that would aid him in facing future threats to Hyrule. Many of his friends gathered on the shore to say goodbye to the savior of the Oracles.